The Commerce Department’s National Institute of Standards and Technology (NIST) has issued two new draft documents on cloud computing for public comment, including the first set of guidelines for managing security and privacy issues in cloud computing. The agency also has set up a new NIST Cloud Computing Collaboration website to enable two-way communication among the cloud community and the NIST cloud research working groups. Cloud computing is a way for nearly anyone or any organization with access to the Internet to rent computer power for applications and data storage from cloud providers who run large computers. Working on a cloud feels the same to users, but the cloud provider performs the many management activities required to keep computers operating and secure. U.S. Chief Information Officer Vivek Kundra asked NIST to accelerate the federal government’s secure adoption of cloud computing by leading efforts to develop standards and guidelines in collaboration with standards organizations, the private sector and other stakeholders. The release of these new publications and the new website are part of NIST’s work to fulfill that mission. 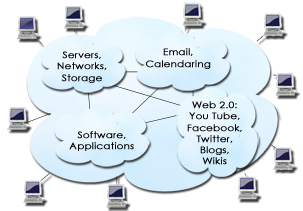 The publications include The NIST Definition of Cloud Computing, which documents years of NIST research on cloud computing, and Guidelines on Security and Privacy in Public Cloud Computing, which provides an overview of the security and privacy challenges for public cloud computing and presents recommendations that organizations should consider when outsourcing data, applications and infrastructure to a public cloud environment. The new Cloud Computing Collaboration website, developed to foster the cloud community’s collaboration on the federal government’s secure adoption of cloud computing, provides information about NIST’s cloud computing program and invites public participation on working groups that address a wide range of cloud computing topics. To comment on these reports, contribute to the Wiki, or get additional information, visit http://www.nist.gov/itl/csd/cloud-020111.cfm.